Our fresh and modern seaside Villa Gräddö with private jetty is now for rent in July and August. 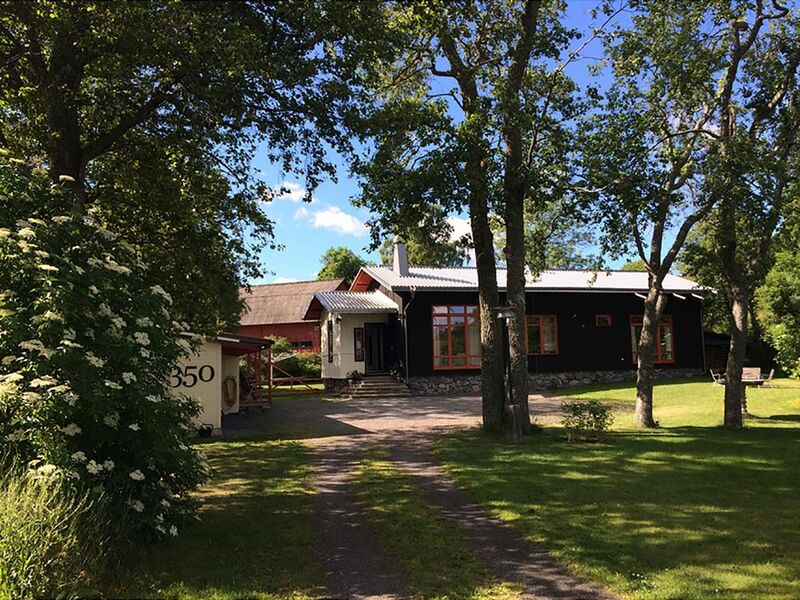 Villa Gräddö consists of three buildings with a total of five bedrooms, eight beds and five showers with toilet. In the main house you’ll find two of the bedrooms, open kitchen with dining area and living room with five meters of ceiling height. Facing south is our orangery with seasonal crops and room for breakfast or dinner seating. By the private jetty you’ll find a rowboat with electric engine, a canoe, a kayak, a floating sauna and a petanque area. A charcoal grill is available to use on beautiful summer evenings. A few minutes walking distance from the jetty is a sandy beach, several nice summer restaurants and bars. This is the Roslagen archipelago at its best. Villa Gräddö have comfortable duvets and pillows, neatly made and ready to use. Towels, fishing gear, charcoal grill, bicycles, petanque balls, sun hats, fast wifi, lawn mowing, departure cleaning and parking is included. In Gräddö and its vicinity you will find plenty of nice activities like swimming, beautiful walking paths, good jogging, sunbathing on the shallow beach at Björkö Örn and local flea markets to visit. Ramble in the woods or take a walk to Räfsnäs. Take a nice excursion to cozy Norrtälje village with its old town, art exhibitions, cinema, concerts, many restaurants, pubs and nice cafés along the river. Gräddö is located 80 km north of Stockholm, on the mainland Rådmansö not far from Norrtälje and close to Kapellskär. It is accessed by car, bus or boat. Supermarket ICA Gräddö is open all year round with a good range of both basic goods and delicatessen. ICA acts as agent for Systembolaget (Swedish liquor store), ATG (Games) and Postnord (Mail). Weekly rent Sunday to Sunday in July and August. Arrival 11:00 hrs, departure 15:00 hrs. Special offers in Gräddö by privat jetty: IF sailboat (4 berths), motor yacht with skipper (6 berths). We have our own pier with a floating sauna, row boat and daysailer. Pets allowed – We have a spaniel dog and a friendly black cat that has her own entrance.